note: in the U.S., the 3rd Sunday of July is National Ice Cream Day, which for 2008 is this Sunday, July 20. i wrote about National Ice Cream Day last year, which you can read at: it is national ice cream day. that post was more tongue-in-cheek. this one is more sentimental. my love for ice cream began with my grandparents. more specifically, my grandmother. as diligent, pious, humble, hard-working, and upright as they were, they allowed themselves to take a respite every now and then, in the form of things like weekly Sundays in sabbath and daily mid-day siestas or afternoons with music and evenings of reading. among them was one that became--although i didn't know it at the time--my personal favorite: ice cream. my grandfather, although he never refused a serving, was not that ardent in his fervor for the stuff. he liked it. but never to excess. certainly not the same degree the rest of us did. my grandmother, on the other hand, was different. 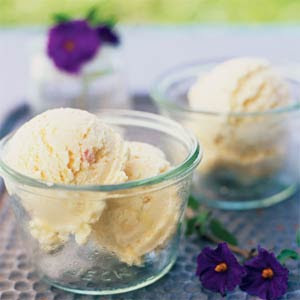 of the two, she was always the first to ask for ice cream, and she always endeavored to have it stocked in the freezer. during summers, and often throughout the year, she always looked to have it available. especially whenever i was sad, or hurt, or struggling to make it through the day. i remember coming home from school as a little kid, with all the weight of the world on my shoulders, and her arms hugging me, and then asking me if i wanted to talk things over. invariably, i'd always shrug, and she'd sit me down at the dinner table, and bring out a cup of ice cream, and we'd sit and share and discuss the state of the world, with me mumbling my sorrows and she listening gently. eventually, sometime between me playing with the spoon and staring at the cup and half-heartedly picking at the ice cream while going through my thoughts, she and i would sort things out. inevitably, at the moment when i had finished my last bite and was scraping the cup and staring at the last remaining melted layers at the bottom, she'd take a pensive look, and softly nod, and offer her advice, qualified by her admission that it was just her opinion, and just her stock of things. and then we'd finish with a hug. and sometimes she would cry and sometimes i would sniffle and we'd both have to go and get a tissue. but somehow i always felt better. i didn't know it then, but those were some of the happiest times in my life. not because of ice cream that i ate. nor the flavors that i chose. nor the scoops that i took. but because they were times of comfort. and moments shared between two people dealing with the profound mystery that is life...and moments shared in an even more profound mystery still: love. i think of her often now. whenever i'm sad, or hurt, or struggling to make it through a day. and i think of being a child once more, and coming home, with all the weight of the world on my shoulders, and her arms hugging me, and asking me if i want to talk things over. she always said that everything went better with ice cream. and she was right. they did.